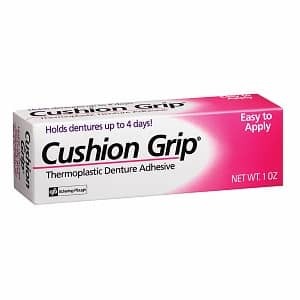 Cushion Grip® Denture Adhesive controls loose dentures by reducing looseness and shifting and a single application lasts up to 4 days of daily cleaning, soaking and brushing. Won't wash off in water. Even after repeated cleaning, Cushion Grip® Denture Adhesive remains soft and pliable. Recreates a secure seal each time you reinsert your dentures. Cushion Grip® Denture Adhesive is SAFE for all plastic and porcelain plates.